john4jack (Corvallis, Oregon, United States) on 2 January 2010 in Cityscape & Urban and Portfolio. 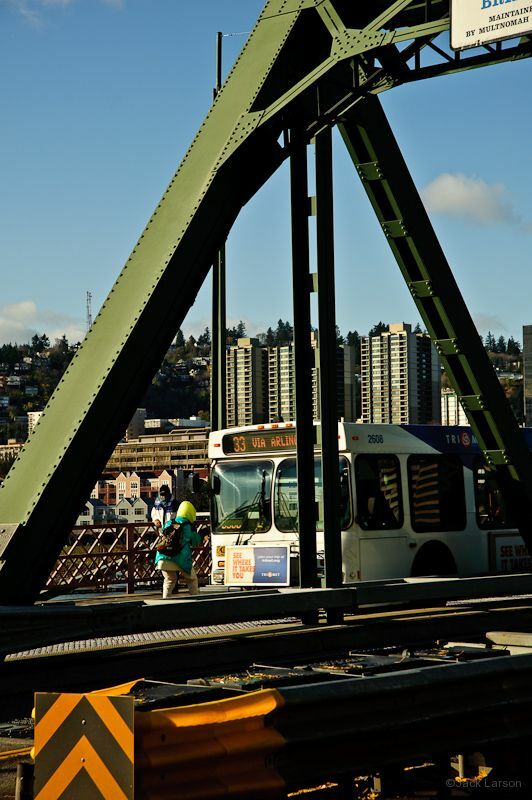 Bus #33 is coming across the Hawthorne Bridge. The timing that someone just happens to appear to be in front of that bus. The clarity is exceptional and I like the tones. Amazing what happens in 5 years. Do you think you could ever go back to film? BEautiful angle and hope not too dangerous place where you standing and shooting this ! Great tones too ! @MARIANA: Thanks, Mariana. I was on a totally protected walkway. What a beautiful clear shot and great tones...and more Portland...I am SO happy ! I will comply with the digital 4 years! and 3 with the horrible PS! I do not want to learn anything more! Computer learning very hard for my age! A splendid picture Jack! It should be "read" very slowly so not a thing! Happy anniversary, master! Zip zip zoom. Life, the bus, camera technology...goes along so fast! Like a world under construction ! Cool compo. It's hard to remember a time before digital cameras and the internet, but I absolutely do...and I have NO idea how I got by?!?! ;) Wonderful clarity and color! Funny thing is with Photoshop, once you have mastered the basics, it seems as though there is always something new to discover every day! Another wonderful image of your bridge ... and so much is going on in this image. @Judy: I would much prefer to be entering the digital darkroom today; it's way easier; so many more user friendly resources. glad we both joined the digital world!! I like the huge metal A with the bus underneath. A strong, graphic feeling image. Well done. Beautiful capure, Jack. Love that hunched over figure going for the bus. I lived about 10 blocks from here for years. Thanks for the memories. And happy new year to you!!! LR is truly the perfect tool. It brings precision much more than in PS. Really a great work here on light and colors. Great job. Excellent angle Jack ! very good for me ! J'aime bien ce cadrage entre les poteaux en fer! Your commentary makes me grin Jack. Photoshop was pretty easy though I am always learning new techniques. It is my camera I am saying that about.. so much to learn! I think you've done well Jack. Yes...the learning goes on and on and is slow for me and I haven't even begun to use Photoshop. And, of course, this photo is life in focus. @Claudia: That was a bright, sunny day. Those are now hard to come by. Winter is great time for exploring B&W. lovely capture. beautifully framed and composed. Me too, Jack. I love digital. I already used Photoshop in my teaching and graphics, so it was like having my own darkroom when I got my digital camera six years ago. Great framing. And that green is so deep and beautiful. great details on the bridge ! Great clarity and framing for this photo ! Love the way you've framed the shot, Jack. A cool composition on this sunny day. jolie scène sur ce pont.